Yesterday saw the blessing of the animals in Felanitx (and other villages) as part of the Sant Antoni celebrations. The blessings are given by the parish vicar with the patron saint for animals looking on. In Mallorca, such benedictions are called Beneïdes. 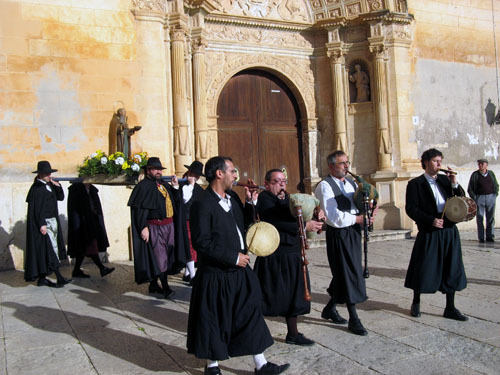 Music was played by a typical Mallorcan Xeremiers group of traditional instruments, including the xeremia (backpipe), tamborí (drum) and flabiol (flute). Luckily, the patron saint for weather was in splendid mood, too. The photo was taken in Felanitx, Mallorca, Spain. The date: January 20th, 2008. The time was 15:37:46. Glad I found your post. If you find other such events, please drop me a line or visit my blog specifically about pet blessings and I’ll make sure to link or mention it! I am compiling a website called The Pipe and Tabor Compendium. I would like to add a link to your photograph under the heading ‘world-wide traditions, Majorca’. I hope that is OK with you. Thanks.